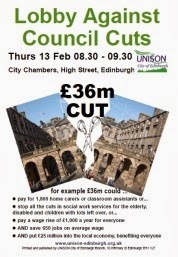 UNISON, the union representing most Edinburgh Council workers, will lobby the council budget meeting on Thursday 13 February from 08.30 to 09.30 to expose the effects of austerity cuts on jobs and services. “Edinburgh Council plans to put through £36 million in cuts. This is on top of £90 million since 2011, and £175 million since 2007. Services just cannot survive with this kind of attack year on year”, said John Stevenson, the union’s Edinburgh Branch President. “We know the cuts are driven by Westminster. We know that Holyrood has just passed these cuts on, singling out local government for the lion’s share. But we want to hear our politicians standing up for our local services, not just passing the cuts on. “We see in the south of England what the effects of failing to invest in public services, like flood prevention, can be. Services are about people, they are relied on by people and they are delivered by people who have seen their spending power slashed and workloads raised to breaking point”. And for the staff who still have jobs, it means…. UNISON is urging the Council to publish a budget that shows how services for the people of Edinburgh could be saved if it were not for government cuts.